After more years than you or I can count, the keeper of the rain is weary. A new keeper has been born, but there is only one problem. He really doesn’t like rain. While he lays basking in the sun, the land around him is drying up. What will it take for the new keeper to finally whisper the word that brings the rain? Here is that rare, engaging and funny climate change story you have been looking for. This very tell-able tale playfully engages very serious questions about our human ability to affect weather and climate. The young keeper of the rain wrestles with his desire for comfort versus his desire to care for the world he loves. The adults and children in our congregations face this same dilemma. This story allows us to see ourselves and our own behavior from a fresh (and endearing) perspective. 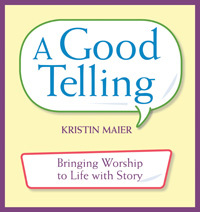 “The Keeper of the Rain” is one of six original stories in Kristin Maier’s guide to storytelling in worship. Two more unique adaptations of classic tales are also included, as well as script for a narrator-based play. Along with the stories, A Good Telling offers concrete techniques for delivering emotionally engaging stories, reflects on the role of story in worship, the art of preparation, and includes an annotated bibliography of story collections, picture books, and other resources. See the author’s website www.kristinmaier.com to view video demonstrations of storytelling techniques and excerpts from “The Keeper of the Rain.” A Good Telling is available in print or as an eBook from Amazon Kindle Store and on Google Play. This entry was posted in Story for Telling. Bookmark the permalink.